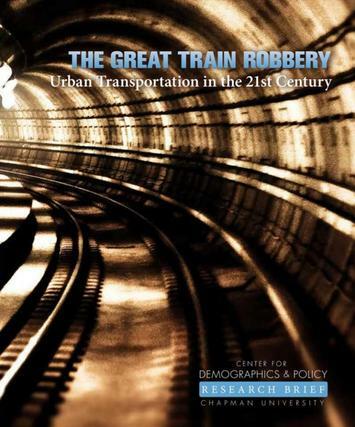 Below is an excerpt from a new report published by the Chapman University Center for Demographics and Policy titled, “The Great Train Robbery: Urban Transportation in the 21st Century." Read the full report (pdf) here. Productive cities could not exist without transportation. Economic performance and job creation in a city — by which we mean a metropolitan area — generally improve when people can reach more job destinations more rapidly. Over time, the ways in which people have reached their worksites has changed. In the distant past, nearly all people walked. Later, they relied on mass transit. Now, people in metropolitan areas rely primarily on cars for transportation to their jobs. However, in some cities, transit remains both critical and effective. These are metropolitan areas with strong historic — legacy — urban cores, which include large, downtown central business districts or CBDs. This is most notable in New York’s central business district, which accounts for a dominant 40 percent of all transit work trip destinations in the country, despite having only two percent of the nation’s jobs. Overall, barely 5.2 percent of all commuter trips nationally are on some form of mass transit. Among the nation’s 53 major metropolitan areas (places with over 1,000,000 population), only 11 exceed this 5.2 percent average.